Straight complete inspection of small size full vials based on the HEUFT SPECTRUM II. Full equipment and automation for maximum detection reliability in an efficient and space-saving straight-through system: the HEUFT spotter II PHS not only has sophisticated optical detection procedures as the first vial inspector of its kind. In addition the fully automatic system offers unique X-ray strobes. Therefore foreign objects are even identified carefully and reliably when they are hidden in an opaque product. Furthermore the compact linear machine finds glass defects, contamination as well as deviations in filling quantity in vials containing between 2 ml and 100 ml and checks the integrity of their crimp caps or screw closures precisely. The result: a continuous complete inspection of vials filled with parenteral drugs and other pharmaceutical products which does not miss a fault. Finding everything everywhere: optimal optics and unique X-ray technology. Hairs, fibres and glass splinters: foreign matter such as this poses a serious threat to the safety of medicinal products. The HEUFT spotter II PHS identifies contaminated vials in good time. High-performance modules carry out the optical inspection of the sidewalls both in the infeed and in the outfeed. A servo-controlled conveyor belt rotates the vials each by 90° between them in a controlled manner - their bases are photographed from below at the same time. This ensures that the detection pictures processed and combined by the HEUFT reflexx2 in real time not only cover more than 360° of the walls but the total volume of each individual vial completely. Foreign objects are therefore reliably identified. Provided that they are not hidden in a non-transparent product. The pulsed X-ray technology exclusively available from HEUFT is the first choice for such serious cases: unique X-ray strobes also make glass splinters or small pieces of metal visible which are hidden inside powders, granules and lyophilised products e.g. in opaque liquids such as emulsions and suspensions. And that with such a low level of radiation that even active pharmaceutical ingredients (APIs) can be examined safely and carefully. Covering everything: continuous all-around inspection. Chips, cracks and product splashing: the redundant optical modules with high-performance cameras and adaptive LED lighting for a sidewall inspection make glass defects and contamination such as these visible everywhere on the container. There are no blind spots because the vials are specifically rotated between the individual inspection units for full coverage and photographs of the whole base area are taken on the way. All glass defects can be detected in this way from chips with loss of material to finest hairline cracks and inclusions. This also applies to material deformation and, for example, spots and streaks on the inner sidewall of the vial caused by product splashing. But other flaws such as variations in the product colour cannot escape the continuous all-around inspection either. Only clean, perfect vials with the correct contents reach the patient. Checking the closure integrity: detailed complete inspection. Correctly positioned, intact and tight: the HEUFT spotter II PHS not only safeguards the functionality of the vial but also the purity and the uncontaminated state of its sensitive contents with a detailed all-around inspection of the flip off closures and crimp caps. The reliable identification of inaccurately positioned, incomplete, incorrectly flanged, dented, defective, leaking and non-brand closures is carried out by two powerful HEUFT FinalView II CAP modules. A continuous all-around inspection is achieved with the correct lighting technologies, optimally arranged, automatically adjustable high-performance cameras and a real-time image processing system capable of learning. The exact container alignment between the two detection stations ensures coverage of far more than 360° in the course of this. In addition the fully equipped vial inspector uses the superior optics for a sidewall inspection in order to examine the position of the stopper with millimetre precision. The respective full vials are detected reliably and removed in good time when the stopper is missing, defective or has been positioned too high or too low or varies in colour. Uncovering underfills and overfills: precise inspection of the dose. Too much, too little or exactly right: the correct dosage is particularly important with regard to medicinal products. Each small individual injection bottle has to contain exactly the amount of liquid, powder, granules or lyo product which should be in it. No more and no less. The HEUFT spotter II PHS carries out a precise fill level detection in order to determine the filling quantity exactly – by means of different optical technologies or using an X-ray measuring bridge depending on the product. Vials with dosages which deviate from the specification because they are either underfilled or overfilled are therefore identified reliably and removed effectively. Automatic, fast and easy: the HEUFT spotter II PHS not only carries out a specific rotation and an exact alignment of the containers for an extensive complete inspection with innovative servo technology. In addition it adapts the height and width of the conveyor belt as well as the positions of the cameras exactly to the changed packaging format during brand changes. This is achieved completely automatically due to clearly reproducible brand adjustments. Furthermore this reduces the need for manual intervention, economizes on human resources and not only saves time but money as well: efficiency and productivity losses due to lengthy changeover times are decreased sustainably. Modular, flexible and multifunctional: There has never been a linear vial inspection system which offers so many possibilities – including pulsed X-ray technology in the fully equipped HEUFT spotter II PHS. 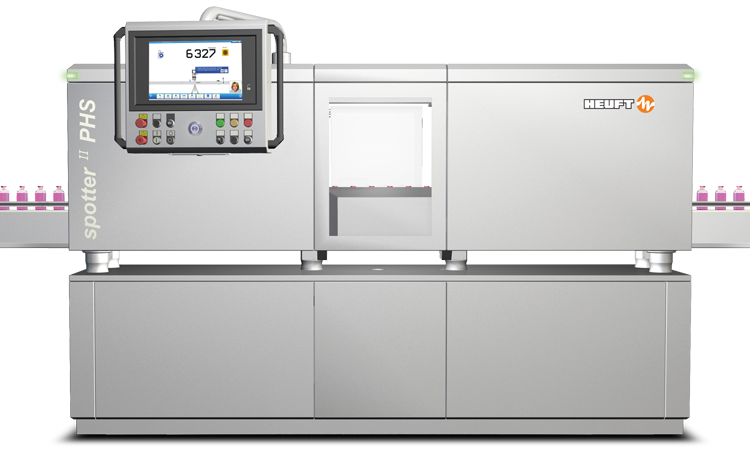 Up to two X-ray flash modules can be integrated and optimally arranged in the highly automated, self-explanatory system of the HEUFT SPECTRUM II generation as an option. As a result high density foreign objects hidden in the product can be detected reliably and carefully at unequalled low radiation levels. And that even in vials containing APIs. There is a choice between two optical modules with different lighting technologies and an X-ray measuring bridge for checking the filling quantity depending on the product and packaging. The redundant use of several fill level detections is also possible for even greater safety. Practically every wish is fulfilled regarding equipment from special buffer tables to lockable reject collection points and modules for the unmistakable marking of rejected faulty vials. The result: unprecedented functionality in a confined space. Simply recording everything: network connection for production data analysis and audit trail documentation. Computer-aided systems for the packaging and quality assurance of pharmaceutical products have to meet strict requirements and documentation obligations. That is also why HEUFT devices are network-compatible. They fulfil the FDA 21 CFR Part 11 requirements with user-related access rights and a detailed audit trail log of all the operating and process information. This protects against unwanted changes to the parameters and makes all user activities permanently traceable. An online connection to higher-level databases and MES systems safeguards real-time transmission, the preparation and complete archiving of detection pictures, batch and production data as well as a reliable audit trail documentation. There is a network connection to the HEUFT TeleService for a reliable remote diagnosis and maintenance. Running linearly: compact straight-through system. The HEUFT spotter II PHS stands out in particular due to its consistent linear operation in addition to an unprecedented level of equipment, functionality and automation. It needs neither a container carousel nor starwheels, centring bells, grippers or change parts in contrast to rotary machines. This makes it extremely compact, enables fully automatic brand and product changes and reduces storage costs. It is also ensured that the sensitive vials are not handled too harshly with the highest possible throughput. After all they should track down defects and not produce them themselves. Specially constructed conveyors ensure that the sensitive glass containers are handled carefully. A wide range of installation positions can be implemented for the space-saving system due to its flexible, modular construction. Special buffer tables for bringing together and fanning out the container flow and lockable reject collection points are further highlights of the straight construction of the fully equipped vial inspector. Removing faulty vials: rejecting without compressed air. Specific, safe and clean: a special rejection system which manages completely without compressed air is included in the scope of delivery of the HEUFT spotter II PHS as standard in order to sort out all the faulty vials in a timely and reliable manner. The HEUFT e-mono has been designed for the safe use in the hygienically sensitive areas of clean room class B. It practically only uses energy at that moment when its rejection segment is extended in order to transport faulty containers onto a buffer table, a conveyor which runs parallel or to special reject collections points e.g. a container. The HEUFT e-mono can even adapt the advance force of the rejection segment to the weight of the product during the rejection procedure due to its flexible control system.